Winter is a time for reflection and appreciation; Strategic Incentives would like to take this opportunity to extend our gratitude to the many contributors to our success and growth. We thank our clients for their continued faith and support, and for allowing us to assist them in providing their customers and employees with custom designed motivation and loyalty incentive programs. Thank you as well to our team of experts for their tireless efforts in providing client satisfaction in terms of sales incentives, marketing, quality, loyalty, change management, and customer satisfaction. The Thanksgiving long weekend marks the beginning of the busy holiday season; heralding the beginning of a new year just on the horizon. What better time to start planning your 2016 incentive program? Devising a solid plan for your incentive program now will assure time for a smooth and successful implementation in the new year. Planning and implementing an incentive program is an excellent strategy by which to attain your 2016 business goals. 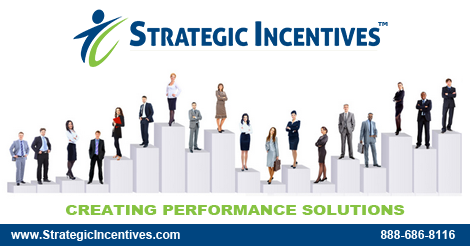 Working with you, Strategic Incentives will create a custom-designed incentive program for your organization. Whether you are trying to foster customer loyalty, increase client base or motivate your sales team, there are several key strategies that should be kept in mind. Budget: Know your budget and plan accordingly. Never try to engage in an incentive program that exceeds your means. Attempting too grand of a plan can undermine its very purpose, resulting in an inability to follow through or a decrease in profits and productivity. We provide you with the tools to measure program effectiveness and return on investment. Know your Audience: It is important to properly identify your target demographic. We will provide you with detailed report results that quantify employee/client needs and concerns. Armed with the knowledge collected through various means, such as surveys and marketing reports, we will be able to design an incentive program specific to your needs. Establish Goals: It is imperative to define clear goals and objectives. Knowing where you are heading will help to determine how you plan to get there. Spread the Word: Communication is key to the success of any incentive program. Not only is it essential to build up anticipation prior to launch, interest must be held as the program progresses. Be Prepared: “The best laid plans of mice and men often go awry” (adapted from Robbie Burns’ “To a Mouse”). Not all variables can be anticipated so it is important to plan for contingencies. Assess Progress Regularly: If there are any concerns with the design or implementation of an incentive program it is far better to find out sooner rather than later. Assessing progress on a regular basis will allow for detection of small issues before they become large ones. Be Creative: Contrary to popular belief, money is not the best motivator. Unusual rewards will generate more excitement and interest in your incentive program. Appropriate Duration: A market analysis can lend insight into the proper duration for your incentive plan. It must be in place long enough to generate the desired outcome, but no so long as to become tedious and redundant. Less is More: There is no need to overcomplicate your incentive program. If your plan is easy to understand it will be easy to follow. This will result in higher interest and increased motivation for enrollment and continued participation. Consult a Professional: Engaging the services of a professional consulting firm will take the guesswork out of planning your incentive program. Strategic Incentives utilizes a tried, tested and true formula to deliver the results that you demand. Our consultants are effective, reliable and responsive; they work with you, not just for you. If you are looking to increase employee productivity, engagement and motivation, our Workforce program is the ideal solution for you. This program can help you to reduce costs, increase revenue and improve the overall work process. Our Customer Loyalty Programs will enable you to attract, retain and expand a solid client following. This will generate greater revenues, encourage repeat business and increase referrals. Our consultants look forward to guiding your organization on its path to growth and success.